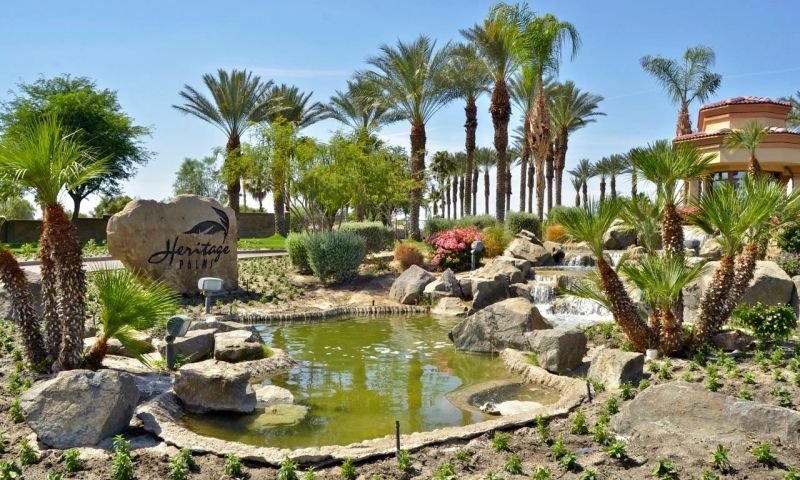 Heritage Palms is a guard-gated golf community for active adults in Indio, California. With 1,004 homesites spread out on 379 acres, Heritage Palms has lots of vast, open spaces. Mature palm trees and beautiful landscaping against the backdrop of the San Jacinto and Santa Rosa Mountains greet residents and visitors alike. This resale community is comprised of single-family homes and attached duplexes. Heritage Palms Country Club is pedestrian-friendly with meandering walking and biking trails. Two community shopping centers are within walking distance and can also be accessed via golf cart. In addition to the semi-private 18-hole championship golf course, Heritage Palms also has a spacious clubhouse and a variety of special interest groups. The Heritage Palms Restaurant is a chef-driven restaurant and offers an patio dining, where residents have views of the golf course and mountains. Residents of Heritage Palms Country Club can also obtain all their golfing accessories and equipment at the on-site pro shop. Buyers are able to choose from single-family homes and attached duplexes that were built between 1995 and 2004. U.S. Homes was the original builder before Lennar acquired this beautiful 55+ community. Floor plans for the duplexes start at 1,382 square feet and go up to 1,605 square feet and feature one or two bedrooms, two bathrooms and an attached two-car garage. The single-family homes range from approximately 1,500 to about 2,500 square feet of living space. Single-family homes at Heritage Palms Country Club offer one to four bedrooms, two to three bathrooms and an attached two or two-and-a-half-car garage. Upgraded features may include granite counter tops, hardwood floors, and more. Heritage Palms offers an affordable country club lifestyle in a beautiful location with low-maintenance homes and a low tax rate. However, there are plenty of other things to do besides playing golf. Special interest groups and social clubs thrive under individual management by motivated residents. Break a sweat with the Tai Chi group, tennis club or a water aerobics class. Join a game of Mah Jongg, poker, or bridge. Special interest groups include the needlework club, singles group, and book club while residents can meet new neighbors at community BBQs or wine tastings. However you like to stay active, Heritage Palms has an group or event to keep you busy. Heritage Palms Country Club is in Indio, California and is situated within minutes of Highway 111 and Highway 10, south of Palm Springs, and borders the cities of Bermuda Dunes and La Quinta. Two shopping centers are within walking distance and two others can be reached in minutes by car. In addition to retail shops, salons, coffee shops, and fine dining, residents have access to medical facilities, including Eisenhower, JFK, and Kaiser Permanente hospitals. Popular entertainment destinations in the Coachella Valley include Coachella Fest, Tamale Festival, La Quinta Art Festival, and McCallum Theatre. Nature lovers will enjoy Joshua Tree National Park as well as hiking and mountain bike trails in the area. The nearest airport is Palm Springs International, less than half an hour away from Heritage Palms Country Club. Active adults in Palm Desert, California will be enthralled with the activities, amenities and homes available at Heritage Palms. Heritage Palms features a 32,000 square-foot clubhouse that acts as the center of social and physical activity for the community. Heritage Palms Clubhouse - 32,000 Sq. Ft.
Heritage Palms Golf Club is a 27-hole, Arthur Hills designed course that is spread among 170 acres of beautiful scenery. There are plenty of activities available in Heritage Palms. Here is a sample of some of the clubs, activities and classes offered here. The duplex homes in Heritage Palms include a total of 152 units available in two different floor plans. The well-designed cozy homes are ideal for budget conscious buyers. The duplexes feature one or two bedrooms, two bathrooms and an attached two-car garage and range in size from over 1,300 square feet to approximately 1,600 square feet. There are 852 single-family homes in Heritage Palms. With floor plans that range from around 1,500 to around 2,500 square feet you are sure to find home to suit your lifestyle. Homes feature one to four bedrooms, two to three bathrooms, and an attached two or two-and-a-half-car garage. There are no hiking or biking paths in Heritage Palms. Dogs are required to be on leash at all times and there is no place to exercise your pet. Heritage Palms is a great community for everything it has plus everything it is close to. Not that you really need to leave very often but all the basics are close by like shopping, restaurants, the hospital and doctors, etc. I enjoy how convenient everything is so I can spend more time enjoying activities vs. traveling to "get to" places to do the boring everyday mundane tasks. None of that for me! 55places.com is not affiliated with the developer(s) or homeowners association of Heritage Palms. The information you submit is distributed to a 55places.com Partner Agent, who is a licensed real estate agent. The information regarding Heritage Palms has not been verified or approved by the developer or homeowners association. Please verify all information prior to purchasing. 55places.com is not responsible for any errors regarding the information displayed on this website.